Find the iPhone 5c you’ve been looking for here! All in all, the iPhone 5c is Apple‘s more colorful version of the popular iPhone 5 model. Featuring an all new design, a 4-inch Retina display, super fast A6 chip, iOS 7 and an 8 MP iSight camera. The iPhone 5c has everything you love about Apple and the iPhone in a fun, very colorful piece of amazing technology. Its 4G LTE connectivity provides support for 10 different LTE wireless bands; more than any other smartphone in the world. The iPhone 5c also sports a slightly larger battery than its older brother, offering you up to 10h of talk time on 3G networks, up to 10h of web browsing on WiFi or LTE networks, up to 10h of video playback, and last but not least, up to 40h of audio playback. The iPhone 5c also comes with the latest version of Apples mobile OS, the iOS 7. Featuring hundreds of new features including Control Center, Notification Center, AirDrop, significantly improved multitasking functionality, an enhanced photo gallery, as well as Siri, the iPhone 5c and iOS 7 are the very picture of efficiency and brilliance. 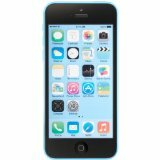 Something interesting with the iPhone 5c is that Apple included iTunes Radio, which is a free Internet radio service based on the choice of music you listen to on your iTunes, providing you with even more ways to listen to your favorite tunes. With all this and so much more, the iPhone 5c will provide Apple users with a more affordable package for the value of the device.